Success! 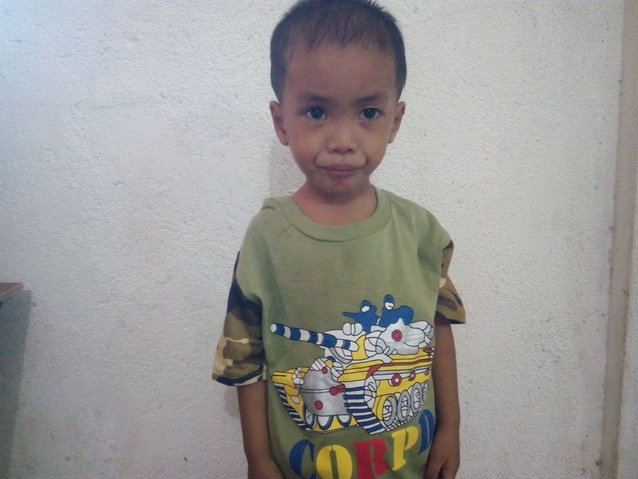 Reynald from the Philippines raised $184 to fund malnutrition treatment. Reynald's treatment was fully funded on November 29, 2016. Reynald received successful malnutrition treatment. He grew to reach a normal height and weight. He also has an increased appetite and more energy. Unfortunately, we do not have a post-treatment photo because Reynald and his mother moved right before the treatment program ended. Reynald is 2-year-old and lives with his parents and six siblings in a small house made of scrap materials in the Philippines. His parents’ source of income is from a small sari-sari store and struggle to feed the family with their earnings. Without proper nutrition, Reynald is thin and weak, suffering from moderately acute malnutrition. One out of five children under the age of five-years-old in communities of our medical partner International Care Ministries (ICM) are either severely or moderately acutely malnourished. Worldwide, poor nutrition is associated with nearly half of all deaths in young children. In remote communities and urban slums of the Philippines, the lack of clean water and unclean environments add risk to potentially fatal childhood diseases. ICM’s Home-Based Feeding program provides nutrient enriched food packs to ensure malnourished children get the additional food to regain normal weight, and achieve optimum physical and mental development. After identifying a child being malnourished, staff and community volunteers make weekly visits to monitor this child’s progress. To help sustain the health of the child, ICM’s professional staff educate the mother, guardian or other family members about proper nutrition, sanitation, hygiene and organic vegetable gardening. Reynald's case was submitted by Mariecris Tuyac at International Care Ministries in Philippines. Reynald was submitted by Mariecris Tuyac, Cebu Health Leader at International Care Ministries, our medical partner in Philippines. Reynald received treatment at Home-based malnutrition intervention program. Medical partners often provide care to patients accepted by Watsi before those patients are fully funded, operating under the guarantee that the cost of care will be paid for by donors. Reynald's profile was published to start raising funds. Reynald's treatment was fully funded. Reynald's treatment was successful. Read the update.